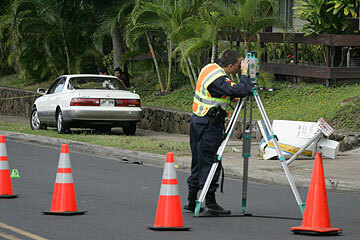 Police officers investigated a pedestrian fatality on Koauka Street in Aiea yesterday. The car at right swerved and hit the signpost, according to witnesses, and an elderly woman was hit on her head by the sign as it fell. A 78-year-old woman became Oahu's sixth traffic fatality so far this year yesterday, and the fifth involving an elderly pedestrian. At about 7:53 a.m. a white 1993 Lexus four-door sedan was traveling southbound on Koauka Street in the right lane heading toward the Moanalua Road intersection. The car was approaching stopped traffic when a car in front of it switched into the Lexus' lane. The Lexus, driven by a 44-year-old Aiea man, swerved right, struck the curb, a newspaper vending machine and a no-parking sign just as Alice Kondo was walking by. The sign hit the 78-year-old Aiea resident in the head, said Maj. Debora Tandal, of the Pearl City substation. Kondo was admitted to Pali Momi Medical Center at about 8:30 a.m. and was pronounced dead 19 minutes later. Police said no arrests have been made. Kondo is the sixth traffic fatality on Oahu, compared with five at the same time last year. What is alarming is how five of the six fatalities so far this year are pedestrians, said Laurie Grochowsky, who lives in a home yards away from where the accident took place. "I'm so scared because my daughter rides the bus home from school," said the 49-year-old mother. "And just the other day, I was sitting in the exact same spot that woman was at. It just shows that our life could change in just seconds." Although speed was not an apparent factor, Grochowsky said it is only a matter of time before another accident happens in the area. Koauka Street and connecting Koauka Loop form a residential area dense with apartments and condominium units, and no crosswalks except at the Moanalua Road intersection. Many parents at Our Savior Lutheran School near the accident site often take illegal U-turns in the middle of the road, instead of going around Koauka Loop as they are supposed to. "It's horrifying," Grochowsky said. "It's a high occupancy here, meaning a lot of cars." Speeding and jaywalking are rampant in the area, said Rick Edds, resident manager of Pearl Regency, where Kondo had lived by herself. 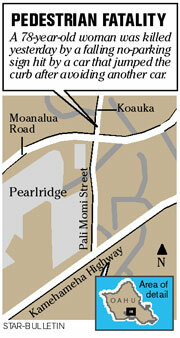 "A lot of accidents happen right there," Edds said, pointing at the Moanalua Road intersection. "People shoot down, trying to make the light. They often don't make the stop out of the loop. And all these people, so many pedestrians." Edds said he did not know Kondo well, but they were acquainted for years. Kondo had stayed at the complex for more than 20 years, longer than Edds had been working there. "She was a very sweet person," Edds said. "She walked everywhere. She was very quiet, reserved and didn't bother anybody. She will be missed." There were 20 pedestrian deaths on Oahu last year; five of them were hit while they were in crosswalks. All of this year's pedestrian fatalities were ages 73 and older. According to AARP Hawaii, the state is the highest-ranked state for pedestrian fatalities for people age 60 and older. On Monday, 81-year-old Fe Bulahan was killed when she was hit by a van as she crossed North King Street in Iwilei. She was in a crosswalk but was unable to make it across the street before the light changed, police said. In Jae Kim, 81, died after being struck by a car Saturday as she crossed Young Street. Floyd Girven, 75, of Ewa Beach died Friday after being struck by a car as he crossed Renton Road in Ewa. Kinue Rosenberg, 73, of Waikiki died after being hit Jan. 7 by a taxi-van as she sat at a bus stop on Kalakaua Avenue.